Vehicle Crash Repairs & Body Work | Yao's Auto Technician & Engineer..
We can use original pattern parts and insurance approved parts during all body work repairs. (Customer’s request) We can also offer the Panel beating of old parts if you choose not to replace a particular component, for example (wing bonnet, door, quarter panel, wing mirror etc.) This can often help reduce costs for the customer although it does take slightly longer to complete. Insurance, fleet and private work undertaken. Repair damage including dent, bumps and scratches. Major accident repair (insurance write offs category c and d). 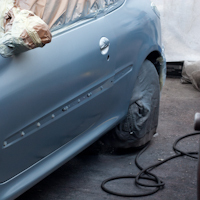 Smart repair (paint less job, polishing or buffer with professional compound / minor body repair whilst you wait. As always, if there are any particular questions you have in mind do feel free to contact us either by phone or email, if need be drop by at the garage for a hands on inspection (contact information and map are available of the contact page.